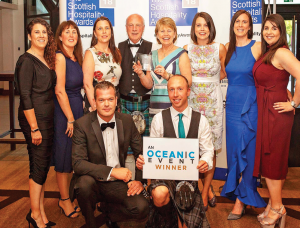 Blair gowrie Holiday Park in Perthshire has been named as Scotland’s Best Caravan Site of the Year at the Scottish Hospitality Awards which took place at Crowne Plaza, Glasgow. Wood Leisure started life just almost 40 years ago when husband and wife Colin and Margaret Wood acquired picturesque Blairgowrie Holiday Park. The couple invested much time, effort and resources to create what is now one of Scotland’s most highly regarded and multi-award winning holiday parks. Building on their success, Colin and Margaret then went on to develop five other parks using the same business formula of combining high quality surroundings with excellent customer service. Their other parks are Corriefodly Holiday Park in Perthshire, Deeside Holiday Park near Aberdeen, Lomond Woods Holiday Park in Ballock, and Campsie Glen near Stirling. The family’s portfolio was added to earlier this year with the acquisition of Callander Woods Holiday park - formerly Gart caravan park – in Perthshire. At Blairgowrie Holiday Park, guests have the choice of a wide range of accommodation options including luxury lodges with private hot tubs as well as touring pitches.